With their layered-look multiple cuff edges, these Elle Frilly Welt Cashmere Blend Ankle Socks have a very distinctive and attractive appearance, in a mix of damson, biscuit and black shades. 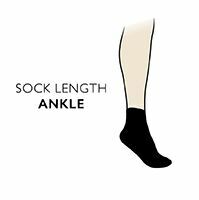 The cashmere blend, combined with modal and other fibres, makes these smooth, fine socks very soft and also warm. The style of both pairs of these contrasting socks makes them a lovely accent touch for shoes, pumps and boots, adding extra interest while also keeping you feeling beautifully cosy and pampered.